Seen when launching Microsoft Excel..
‘C:WindowsSysWOW64SGXLADDIN.dll’ could not be found, Check the spelling of the file name, and verify that the file location is correct. You are seeing this because you have installed a Sage accounting product in the past and it dropped some add-ins into Excel. 1. 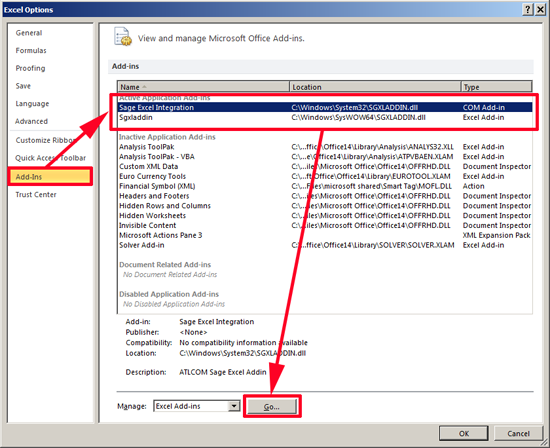 Close the error > Click File> Options > Add-Ins > Select the “Sage Excel Integration” > Go. 2. Untick sgxladdin > OK > Yes. 3. 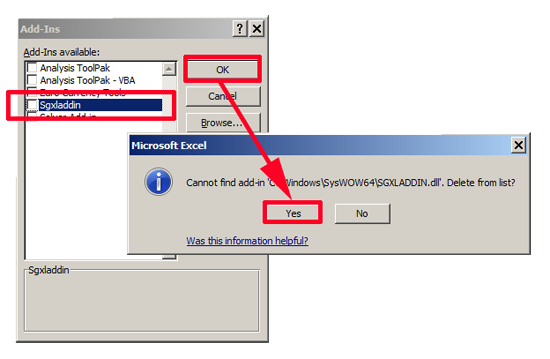 Now restart Excel and you should be error free.